I have written so much about free here at AVC that it should be called AVFree. In fact, I've even written a post with this exact same title (almost exactly seven years ago, the summer we invested in twitter, zynga, and tumblr). I haven't touched this subject much in the past few years but given that the topic has been in the air in the tech blogosphere, I thought I'd address it again. First, let me say this is specifically not about Twitter. Folks should be encouraged to compete with Twitter. Competition is good for everyone as we talked about here a week or so ago. This post is in reaction to the idea that services should be paid to ensure that they are appropriately focused on the consumer/user as opposed to the marketer/advertiser/sponsor. Let's start with advertising. I do not believe it is evil. In fact, I believe it is a fantastic way to support services that want the broadest adoption and want to be free. Think about the Super Bowl, the World Cup, the Olympics, the Oscars, the Presidential Debates, the news coverage of important events. These things are ad supported and free for anyone to watch who has a TV and an antenna. It is good for society for these things to be available to the broadest audience. There is a paid TV business and it is flourishing. The fact that at its base level TV is free does not mean that all TV has to be free. Free TV does not commoditize paid TV. They co-exist nicely. But we had free TV well before we had paid TV. Free is the foundation that creates a paid tier. That's what Freemium (a term that was coined here at AVC) is all about. Now let's examine services that have a free and paid tier. Spotify is a good one to look at. Spotify's core business model is a subscription music service. All you can eat music for a fixed price every month. 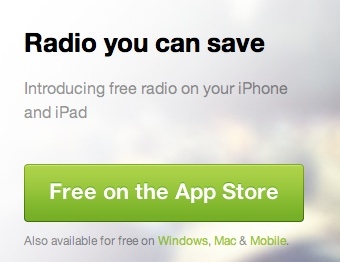 And yet this is what they show you when you land at Spotify.com for the first time. Why do they show you that? Because most people prefer free to paid. I don't have the exact numbers but I would suspect less than 10% of Spotify's users pay for music. Why is Pandora so successful? Because it is free. Why is over the air radio still the most popular way to listen to music? Because it is free. Now let's look at servces where the users provide all the value. Wikipedia, Craigslist, YouTube, Flickr, Instagram, Facebook, Twitter, Tumblr, WordPress, etc, etc. There is no value to any of these platforms if the users don't create the content. The users create the service, curate it, and make it what it is. I do not believe it makes sense to charge users to create the value. We've seen folks try this model. Typepad (where this blog is hosted) charges to host a blog. How well did they do? Phanfare charged to host photos. How well did they do? The list could go on and on but I don't want to focus on failed services. When scale matters, when network effects matter, when your users are creating the content and the value, free is the business model of choice. And I don't think anything has changed to make that less true today. If anything, it is more true. I understand the frustration of certain folks about the commercialization of Twitter, Facebook, Tumblr, and a host of other services. I understand the frustration over the increasing lock down of the APIs and the control these platforms are exercising on their ecosystems. I would encourage folks to compete with them to keep the web, the mobile web, and the Internet free and open. But I would not encourage those same folks to build paid services. I think their goals will be undermined by that choice.